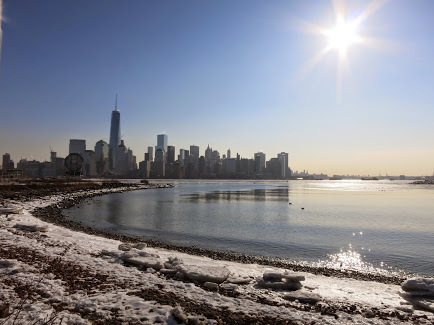 Winter scene at Jersey City’s waterfront facing downtown Manhattan. During most winters, I live at the edge of resistance, fighting against the cold and doing my best to stay out of it but a walk to the Jersey City waterfront quickly nullifies any need to do battle. The sun glimmers off of the Hudson River and the crisp, cool air brings the New York city skyline into sharper focus. Breathing in the afternoon’s surrounding stillness, I let go and relax into what is. In that space between the breaths, between the paragraphs, between the distracting, grumbling, “complaining about winter” thoughts, I find openness and acceptance. I’m free to move on and just be. Meditation is one way that I’ve become more comfortable dropping in to that present moment. Using the breath as a guide, I’m able to see what’s going on. I’m able to appreciate the beauty of winter’s beach. So instead of trying to escape winter, trying to stay warm, trying to make summer happen now, I am in the practice of opening up to the wild richness of its current display. That it is here to stay as long as it wants to. That there is nothing I can do to change that.